School policies are created through a process of consultation and collaboration between the staff, the Parents Association and the Board of Management. This policy will inform the acceptable use of the internet within St. Anthony’s BNS, Ballinlough. The aim of the policy is to ensure that pupils will benefit from learning opportunities offered by the school’s Internet resources in a safe and effective manner. Internet access is considered a school resource and privilege. If the AUP is not adhered to, this privilege may be withdrawn. In certain cases, certain sanctions– as outlined below – will be imposed. It is envisaged that the AUP will be revised on a regular basis as deemed necessary by changing circumstances. Before signing the Undertaking below, this AUP should be read carefully. The Board of Management of St. Anthony’s will support and encourage the staff of the school in undertaking continued professional development in the area of internet safety awareness. The Schools Broadband Programme (SBP), managed by the National Centre for Technology (NCTE), offers all Irish schools content filtered broadband. The School will monitor individual pupil’s Internet usage. The School will provide the staff, parents and/or children of the school with the opportunities to attend Internet Safety talks every two years. Issues on Internet safety will be discussed with the children prior to beginning work on the Internet. The use of memory sticks and CD-Rom’s in school requires a teacher’s permission. Pupils will observe ‘Good Netiquette’. (This refers to ‘etiquette on the Net’). This will be explained during the discussion on Internet Safety. All parties; i.e. Board of Management, parents, teachers, staff and pupils, will be requested to adhere to the AUP of the school. Pupils will use the Internet for educational purposes only. Pupils will not visit Internet sites that contain obscene, illegal, hateful or otherwise objectionable material. Pupils will never disclose or publicise personal information about themselves or others. Pupils will be aware that any usage, including distributing or receiving information, school-related or personal, may be monitored for unusual activity, security and/or network management reasons. Pupils will report accidental accessing of inappropriate materials in accordance with school procedures. Downloading materials or images not relevant to pupils’ studies, is in direct breach of the school’s Acceptable Use Policy. Pupils will be given the opportunity to have their work published by the class teachers on the school website. The school will endeavour to use digital photographs, audio or video clips focusing on mainly group activities. The school website will avoid publishing the last name of individuals in a photograph. Personal pupil information including home address and contact details will never be published on the school web pages. Pupils will have copyright of their own work which is published on the school website. 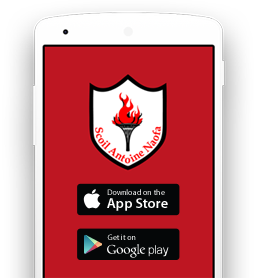 Our School App is St. Anthony’s BNS App. Communication with new or prospective parents. Parents informing school of child’s absence through the absence notification function. Communication of school related news. Continued advancement of our school communication system with information shared via paper notes, email, website, push notifications on the app & now social media. The school will endeavour to use digital photographs, audio or video clips focusing on mainly group activity. Our School App feeds are connected to the school homepage on our website. Communication with wider audience of school life via possible communication tours -photos of pupils, pupil’s projects, notice boards, etc. Continued advancement of our school communication system with information shared via paper-notes, email, website & now Facebook. Users should not ask to become “friends” with individual staff members. Users cannot tag or post photographs of children on the page without the permission of the school authority. The sanction for breaking these rules is automatic blockage from our Facebook account. Pupils will not send any material that is illegal, obscene, defamatory or that is intended to annoy or intimidate another person. Pupils will not reveal their own or other people’s personal details, such as addresses, telephone numbers or pictures. Pupils will never arrange a face-to-face meeting with someone they only know through emails or the internet. Internet Chat is not allowed. The use of chat rooms is not permitted by the school. The school acknowledges that some pupils may need to bring a personal device with them to school from time to time, however we encourage children to bring these only when required or deemed necessary by a parent or teacher. Example: For safety when a pupil may be taking the bus home. Where a pupil brings a mobile phone to school, the phone must be switched off during the school day and may not be used for any purpose on school premises or grounds. No pupil may have a mobile phone on his person. All devices must be handed up to the class teacher and will be kept in locked storage until home time. The school accepts no responsibility for replacing lost, stolen or damaged mobile phones in the pupil’s or school’s possession. The safety and security of mobile phones in the pupil’s possession is wholly a matter for pupils/parents. Phones may not be turned on until pupils have left the school grounds. Pupils using their own technology in school, such as leaving a mobile phone turned on or using it in class, sending nuisance text messages, or the unauthorised taking of still or moving images with a mobile phone camera, are in direct breach of the school’s Acceptable Use Policy. Pupils found in contravention will have phones confiscated to the office and their parent/guardian will have to collect it in person on their behalf. Pupils may not take photographs or make recordings, video or audio with mobile phones. Using phones in such a way can seriously infringe on pupils’ rights and appropriate sanctions maybe imposed. Allegations of incidents where pupils use mobile phones to bully other pupils or send offensive messages or calls will be investigated under the schools Anti-Bullying policy. It should be noted that it is a criminal offence to use a mobile phone to menace, harass or offend another person. As such, the school may consider it appropriate to involve the Gardaí. Photographs – camera and audio recording functions may only be used under the direction of the teacher. iPads must be handled with care at all times – protective/cases used at all times. iPads remain the property of the school. Loss/damage to iPad must be reported to the teacher as soon as possible. Responsibility for the iPad is with the pupil and when not in use must be given to the teacher or locked in a secure place. Screensaver – pupils are prohibited from installing a personal screensaver on school iPads or computers. Filtering is a term used to describe a way of limiting the content of web pages, emails, chat rooms and other electronic data to which users may be exposed. The school will use the Internet provided and filtered by the NCTE. St. Anthony’s BNS also uses additional filtering software on all school computers, iPads etc. which further filter pupils’ access to the internet. It is widely accepted that while essential, no filter is 100% effective. This policy stresses that the most effective filtering tool is adult vigilance. At St. Anthony’s BNS we believe that the advantages to pupils having access to information resources and increased opportunities for collaboration far exceed any possible disadvantages. The access to websites from all school computers is monitored and regularly reviewed by the NCTE. Access to websites is only allowed following a verification of their suitability. We use Information Communication Technology (I.C.T.) and the internet connection for learning. The following rules will help us to be fair to others and keep everyone safe. Pupils will seek teacher’s permission before accessing any website. Pupils will not use email for personal reasons. Pupils will only use email for projects and with their teacher’s permission. Pupils will not use internet chat rooms. If pupils see anything they are unhappy with, or if they receive a message they do not like, they will tell a teacher immediately. Pupils know that the school may check their computer files and may monitor the sites they visit. Pupils understand that if they deliberately break these rules, they could be stopped from using the Internet and computers and their parents will be informed. The school expects all parents/guardians to engage in teaching their children about the responsible use of the Internet. As a parent/guardian if any issues/concerns arise regarding internet safety or misuse of the internet in school I will report it to the principal immediately. Please review the school Acceptable Use Policy available on the school website. Please sign and return this permission form to the school. I will not have my phone or personal device turned on while I am on school grounds or on school trips. My phone or personal device will be confiscated by a teacher if this rule is broken. My parent/guardian must collect my confiscated phone or personal device from the school office. As the parent or legal guardian of the above pupil, I have read the Acceptable Use Policy and grant permission for my son or the child in my care to access the Internet. I understand that Internet access is intended for educational purposes. I also understand that the school cannot be held responsible if pupils access unsuitable websites, but that every reasonable precaution has been taken by the school to provide for online safety. I understand that if the school deems it appropriate, my son’s schoolwork may be chosen for inclusion on our school’s website, Facebook or School APP. My son’s picture along with his first name may also be published on school accounts. No personal details will be given with the pupil’s pictures, group photos will be used in the majority of cases. Please sign to confirm that you are granting permission for this.